Heart and brain surgeries are called "hypothermia-dependent" procedures because doctors often have to lower their patients' temperatures during surgery. The thing is, human blood doesn't transport oxygen as well at cold temperatures. Surgeons rely on synthetic blood substitutes to help the patient's body cope. 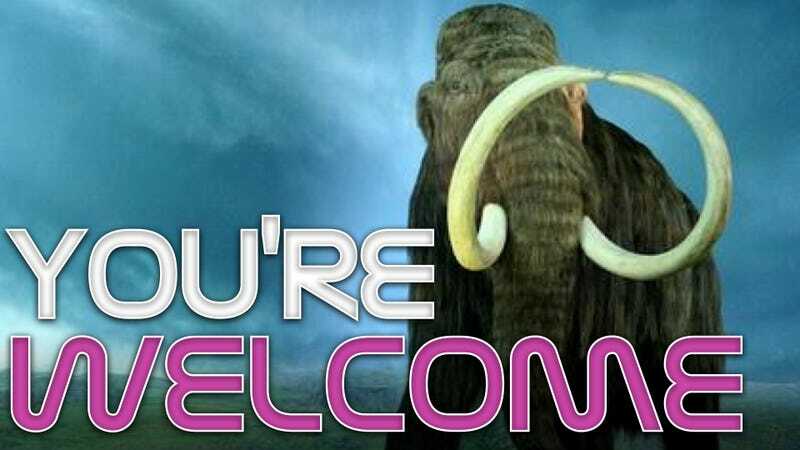 Now, a team of scientists have revealed how the blood of a 43,000-year-old wooly mammoth may hold the key to designing even more effective blood substitutes. Last year, a team of scientists led by researchers Alan Cooper, Kevin L. Campbell, and Chien Ho used DNA extracted from the bones of a 43,000-year-old wooly mammoth specimen to resurrect the creature's hemoglobin, the protein responsible for shuttling oxygen around in your bloodstream. Initial examinations of the lab-created hemoglobin (which the scientists assert is identical to what you would have found coursing through the veins of a woolly mammoth way back in the Pleistocene) revealed that it was specially adapted to bind and release oxygen even at frigid Arctic temperatures. Now, the same research team has published an in-depth, follow-up analysis of the Mammoth's hemoglobin, providing new insights into the structural mechanisms that affect its function. The team's study has revealed mutations in the woolly mammoth's DNA; their results suggest that these mutations, while small, are what gave rise to a hemoglobin protein that is shaped slightly different than our own. It is this small change in protein configuration that is thought to underlie the mammoth hemoglobin's ability to perform even at cold temperatures. The scientists say that further research will be necessary before these structural features are applied to the design of novel blood carriers, but they're optimistic that their findings will "[aid in] the design of a new generation of medically relevant Hemoglobin-based oxygen carriers." And realistically, what's not to be optimistic about? We're talking about implementing paleobiology into the future of medicine. If the thought of a protein modeled after the hemoglobin of a 43,000-old-woolly mammoth coursing through your veins doesn't inspire within you a heightened level of confidence in the future of science...then I honestly can't think of anything that would.